The cause of your neck pain if you just get it at your desk is likely to be a postural problem. It could also be as a result of a poor workstation set up. I would recommend reading over our workstation blog and our how to improve you posture blog . Also if you are getting pain or tingling down your arm(s) I would advise seeing a physiotherapist. 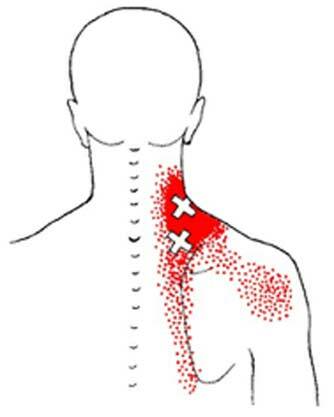 In my clinic I see a lot of desk workers with problems with their levator scapula muscle. 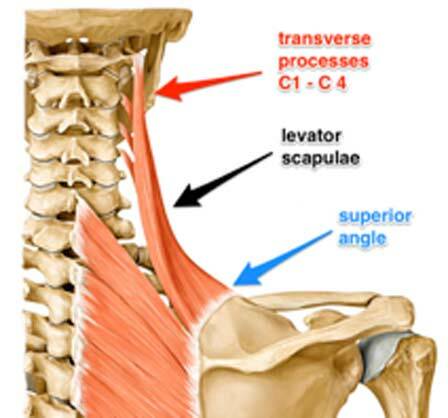 As you can see in the below diagram, the muscle attaches on both sides from the top of the shoulder blade (superior angle) onto the transverse processes of the upper 4 neck bones. Hold this stretch for up to 20 seconds and repeat 5 times (stop if you feel dizzy). Heat on the muscle will also help relax the muscle and ease the pain. If you don’t improve your posture and increase the strength of your lower trapezius then you will continue to suffer with the same problem. If you haven't already signed up Try our 14 day free trial.